Park Forest, IL—(ENEWSPF)—June 28, 2010. No need to travel far this upcoming 4th of July for a fun-filled holiday for the whole family. Just head over to Central Park in Park Forest for the annual parade, children’s activities, music and or course, a great fireworks display. You can find details about Park Forest’s 4th of July activities in the ‘Arts & Entertainment’ section below. If your community group would like to participate in the 4th of July parade, please call Mike McNamara at 708-748-9636 or email at [email protected] for an entry form. If your club, organization or local business will be holding activities or events in our community during the upcoming week, please send an e-mail to RJPi[email protected] with the details. Submission deadline is noon on Friday of each week. The Village Board met on Monday, June 28 at 8 p.m. at Village Hall. Village Board meetings air live on cable access channels (Channel 4 for Comcast subscribers and Channel 99 for AT&T subscribers) as well as on the Village web site at www.villageofparkforest.com. Senior Citizens Advisory Board – Thursday, July 1 at 1 p.m. Environment Commission – Thursday, July 1 at 7 p.m.
As part of the continuing renovations at the Park Forest Library, the building is temporarily closed to allow for asbestos abatement and to erect some necessary partition walls before the final phase of construction can be completed. The library will reopen on Tuesday, July 6 at 10 a.m. Books and other library materials may be returned during this time at the book drop located on the west side of the building near the rear entrance. During the closing no book donations can be accepted. For more information, call 708-748-3731 or visit www.pfpl.org. DownTown Park Forest Business After Hours – All Are Invited! The Village of Park Forest invites all residents and business professionals to get acquainted with Park Forest’s fabulous DownTown business community at the Business After Hours, taking place Wednesday, July 7 from 5:00 – 7:00 p.m. 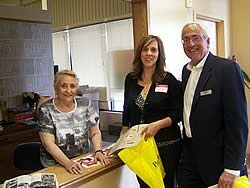 The Business After Hours allows residents the opportunity to tour DownTown businesses and engage with employees of those businesses. In the process, residents become more familiar with the many great services and products available right here in Park Forest and become eligible for cool giveaways. The event begins at Dining on the Green, 349 Main Street, with registration. Participation is free. Following registration, participants will be provided an area map. By visiting as many of the participating DownTown businesses on the map as possible, residents increase their chances to win great prizes once crossing the finish line. Bring your signed map back to the starting location at Dining on the Green to find out what you’ve won. Stick around DownTown Park Forest for Main Street Nights and enjoy live music and fun for the family. For more information about the Business After Hours, contact Monica DeLord at 708.283.5617. Starting at 7 p.m., the Chicago Boyz Acrobatic Team, a professional gymnastics troupe consisting of talented young men and boys from the Chicagoland area will perform stunts and tricks. At 7:45 p.m., R-Gang will combine musical expertise and showmanship while playing R&B music from the Motown era through the ‘90s. Voted Suburban Nitelife Magazine’s Best R&B band in Chicagoland. Grab a blanket, pack a snack and position yourself in Park Forest’s DownTown Village Green, (Cunningham and Main Streets) for FREE entertainment. In case of rain, performances will be moved to Freedom Hall, 410 Lakewood Blvd. Call the recorded message at 708-283-5647 for weather-related changes or cancellations. For additional information, call the Recreation office at 708-748-2005. 5 p.m. Children’s area opens with inflatable and temporary tattoos. 6 p.m. July 4th Parade kicks off from North Orchard near the Aqua Center. The parade route provides plenty of opportunity for viewing, as the parade winds its way around Central Park, Orchard to Westwood, to Lakewood and back to Orchard. 7 p.m. FREE concert by BBI on the main stage in Central Park. BBI lays down the classics from Motown, R&B, rock and roll, to current dance hits. 9:15 p.m. Fireworks begin at Central Park following the concert. For additional information, contact the Park Forest Recreation & Parks department at 708-748-2005. Have a hot dog, chips and a drink before or during the fireworks display. For more information call 708-476-0064 or visit www.parkforestil.lionwap.org. Looking for a fun volunteer opportunity? The 1950s Park Forest House Museum is looking for you. It is fun to show the museum and share stories with the visitors. You don’t have to live in Park Forest, or ever have lived here to be able to show the museum. You don’t have to have lived through the 1950s to enjoy it. There is a script, but you don’t have to memorize it. If you have some time to help out, contact Jane Nicoll at [email protected]. Gallery hours are Tuesday, 10 a.m. to 4 p.m., Wednesday, 10 a.m. to 4 p.m., and Friday, 12 noon to 4 p.m., Saturday, 10 a.m. to 4 p.m. For more information call Pat Moore or Bev Szaton at 708-833-5108. Another Black Hour will perform with Shadow of a Doubt on Saturday, July 3 at Bungalow Joe’s, 7406 Jensen Boulevard, Hanover Park. For more information about Another Black Hour, visit www.anotherblackhour.com. ‘Synergy, Works by Union Street Artists,’ is a diverse collection of drawings, paintings, mixed media, and sculpture pieces by nine of the resident studio artists of Union Street Gallery. The exhibit will be on display from June 21 through July 29 at Prairie State College’s Christopher Art Gallery, located at the college’s main campus, 202 S. Halsted St., Chicago Heights. An opening reception will be held on Thursday, June 24 from 4:30 p.m. to 7:30 p.m. Gallery hours are Monday through Thursday from 9 a.m. to 3 p.m., and Wednesday and Thursday from 5 p.m. to 7 p.m. Visits can be made by appointment. For more information about the exhibit, or to make an appointment for a visit, contact the Prairie State College Foundation at 708-709-3636. Registration is under way for this summer’s Chicago Bulls Youth Basketball Camp, co-sponsored by Governors State University (GSU) and the Village of Matteson. The camp will take place July 12 through 16 at GSU, 1 University Parkway. The weeklong camp is a great opportunity for boys and girls ages 6 through 14 to improve their fundamental skills in ball handling, shooting, passing, defense, and rebounding. Players will be divided into two groups; Rookies (ages 6 to 8) and Veterans (ages 9 to 14) so that every child receives appropriate attention and instruction. Sessions are scheduled from 8:30 a.m. to 11:30 a.m. daily. Participants will receive a Chicago Bulls Training Academy basketball, gym bag, T-shirt, player evaluation, and graduation certificate. Space is limited and registration will be accepted on a first-come, first-served basis. Registration deadline is July 10. Registration forms are available in GSU’s Recreation and Fitness Center of by calling 708-748-1080. The AARP Safe Driving Classes will be held on Tuesday, July 6 at 9 a.m. at Park Forest Village Hall, 350 Victory Drive. The course qualifies seniors for a discount on the liability portion of their car insurance. The discount is good for three years, but you must contact your insurance company. The fee for the class is $12 for AARP members and $14 for non-members. Payment by check ONLY, must be brought to class, along with your AARP membership card. Call the Rich Township Senior Center at 708-748-5454 or Brenda Walker at the Park Forest Health Department at 708-748-1118 to make your reservation. [email protected] is a three-week summer enrichment program for children entering 2nd through 7th grade. The program will be held Monday through Thursday, July 12 – 29 from 9 a.m. to 2:45 p.m. at PSC’s Adult Training and Outreach Center located on the college’s main campus. The day is split into two sections. Morning classes include language arts, math, computers, reading, art and science. Afternoon classes include sports taught by physical education instructors and classes such as first aid, babysitting, Spanish, and study skills. More information about the [email protected] program is available in the summer class schedule at www.prairiestate.edu/bus/bus-kids.html or call Mike Moody at 708-709-7711 or email at [email protected]. The Village of Park Forest invites all residents and business professionals to get acquainted with Park Forest’s fabulous DownTown business community at the Business After Hours taking place on Wednesday, July 7 from 5 p.m. to 7 p.m. The event allows residents the opportunity to tour DownTown businesses and engage with employees of those businesses. In the process, residents become more familiar with the many great services and product available right here in Park Forest and become eligible for great giveaways. The event begins at Dining on the Green, 249 Main Street with registration. Participation is free. Following registration, participants will be provided an area map. By visiting as many of the participating DownTown businesses on the map as possible, residents increase their chances to win great prizes once crossing the finish line. Bring your signed map back to Dining on the Green to find out what you’ve won. And plan on sticking around DownTown Park Forest for Main Street Nights and enjoy live music and fun for the family. For additional information about Business After Hours, call Monica DeLord at 708-283-5617. July is Customer Appreciation Month at the Good as New Thrift Store. During the entire month of July, customers will receive free candles just for shopping. When a customer spends as little as $10, they select a free small candle, spend $25 and choose a free medium candle, and by spending $50 you will receive a large candle. In addition to selling donateditems, the Good as New Thrift Store also has a New Is Good department which features brand new merchandise at great prices. And 100% of the proceeds from the purchases made at Good as New Thrift Store are used to support programs for individuals with disabilities provided by the Sertoma Centre, Inc. Store hours are Monday, Wednesday, Friday, Saturday, and Sunday, 10 a.m. to 5 p.m., Tuesday and Thursday, 10 a.m. to 7 p.m. For additional information, call Karey Wentz at 708-481-5627. Fresh, locally grown fruits and vegetables are coming to GSU at its first-ever outdoor farmers market on Thursday, July 1 at the south end of Parking Lot D. Hours are 1 p.m. to 6 p.m., rain or shine. The Farmers Market will be held on Thursdays through September. If you, or someone you know, are struggling to pay for medications every month, they may be able to get the medicines they need for free or almost free through the Partnership for Prescription Assistance. If you live in Illinois, you can get access to more than 475 public and private programs available to help you pay for your medicines. Simply visit http://www.pparx.org/en/click_illinois to find out if you can apply to any of these great programs and to get connected with 10,000 free clinics and doctors. On Thursday, July 1 from 8:30 a.m.to10:30 a.m., the Connect Café is a place for the community to hang out, have a cup of coffee, latte, or hot chocolate, listen to music, talk, play a game of chess, or just relax. Kid friendly, also for Mom’s and Dad’s. This event will be held every Thursday. For more information, call 708-748-1995 or visit www.celebration4.org. Come sit, sip, sing or just relax. Join us for karaoke, open mic, food, coffee and other fun beverages. We are looking for community talent. For more information, call 708-748-1995 or visit www.celebration4.org. All adults 55 and older are invited to join this monthly support fellowship that combines food, interactive Christian bible study, informative workshops, arts and crafts and birthday celebrations. For more information, call Mattie Morgan at 708-502-6536. Sources: Park Forest 2010 Summer Recreation Programs & More; Park Forest Winter/Spring 2010 Recreation Programs & More, Village of Park Forest, Governors State University, Prairie State College, Union Street Gallery, Park Forest Rotary Club, South Suburban Family Shelter, Park Forest Historical Society, Illinois Theatre Center, CAUTION, Another Black Hour, Sertoma Centre, Inc., Holiday Star Theater websites.